Identification of Learning Disabilities: Research to Practice is the remarkable product of a learning disabilities summit conference convened by the Office of Special Education Programs (OSEP) in August 2001 and the activities following that summit. Both the conference and this book were seen as important preludes to congressional reauthorization of the historic Individuals With Disabilities Education Act (IDEA) scheduled for 2002 and subsequent decision making surrounding implementation. The OSEP conference brought together people with different perspectives on LD (parents, researchers, practitioners, and policymakers) and resulted in this book, which examines the research on nine key issues concerning the identification of children with learning disabilities. Coverage includes alternative responses to treatment, classification approaches, processing deficit models, and approaches to decision making. Chapter Structure-- Each of the first nine chapters is organized around a lengthy, issue-oriented paper, which presents the most current research on that topic. These primary papers are then followed by four respondent papers that reflect a variety of viewpoints on the topic. 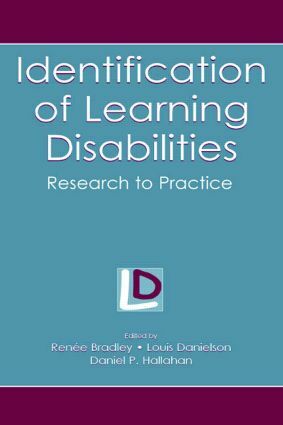 Summarizing Chapter -- A small group of researchers (listed in the final chapter) dedicated an enormous amount of time to summarizing the research and developing key consensus statements regarding the identification of children with learning disabilities. Their work is sure to have a tremendous impact on future discussions in this area. Expertise-- The following well-known scholars have helped summarize the vast amount of research presented in this book as well as the consensus statements derived therefrom: Lynne Cook, Don Deshler, Doug Fuchs, Jack M. Fletcher, Frank Gresham, Dan Hallahan, Joseph Jenkins, Kenneth Kavale, Barbara Keogh, Margo Mastopieri, Cecil Mercer, Dan Reschley, Rune Simeonsson, Joe Torgesen, Sharon Vaughn, and Barbara Wise.